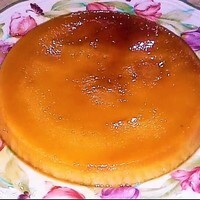 Caramelize sugar in a round aluminum mold. Set aside. Soak bread in milk for a few minutes. Blend the soaked bread, vanilla, eggs, & sugar. Pour batter over the caramelized sugar. Cool. Loose the side of the mold by knife and quickly turn the pudding into a serving plate. Please subscribe to my YouTube cooking channel (Lipardo's Global Kitchen) for more recipes around the world and future raffle draws for giveaway prizes.